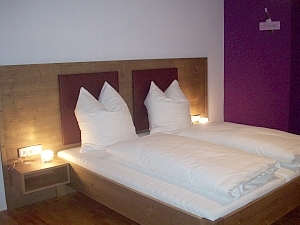 All Double Rooms can be booked as a Single Room too. You're travelling by bicycle or want to go cycling? We also have a bike shed to keep your bikes safe and dry. You can find detailed photos of the rooms and room prices* by clicking the grape varieties on the left. We're available from monday to sunday, 7.00 am to 9.00 pm at telephone 09325 / 979408-0. Rooms are ready to ceck in from 2.00 pm. If your arrivel will be later than 6.00 pm, please let us know, otherwise we may let the room to someone else. * All room prieces are meant inclusive Value Added Tax.